New research by the University of Southampton has found a mechanism as to how corals use their pink and purple hues as sunscreen to protect them against harmful sunlight. Many reef corals need light to survive, as they benefit from sugars and lipids that are produced by their light-dependent symbiotic algae. However, in the shallow water of coral reefs, light levels are often higher than required by the corals, so paradoxically, the vital sunlight can become harmful for the algae and their hosts. Apart from temperature, light stress is a major driver of coral bleaching – the loss of the symbiotic algae that represents a threat to coral reef survival. 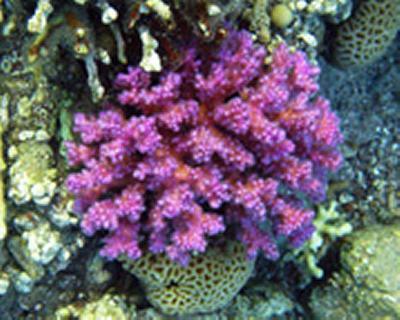 Working in the Great Barrier Reef and under tightly controlled conditions in the Coral Reef Laboratory of the University of Southampton, the team of researchers produced experimental evidence that the pink and purple chromoproteins can act as sunscreens for the symbiotic algae by removing parts of the light that might become otherwise harmful. Dr Jörg Wiedenmann, Senior Lecturer of Biological Oceanography and Head of the University’s Coral Reef Laboratory, who led the study says: “The beautiful pink and purple hues that are produced by the coral host are often evoked by chromoproteins; pigments that are biochemically related to the green fluorescent protein (GFP) of the jellyfish Aequorea victoria. In contrast to their green glowing counterpart, the chromoproteins take up substantial amounts of light, but they don’t re-emit light. The researchers also proposed an explanation for the mysterious phenomenon that some corals accumulate exceptionally high amounts of chromoproteins in growing areas, such as branch tips or in the region of healing wounds. Dr Wiedenmann, who is based at the National Oceanography Centre, Southampton, explains: “These growing areas contain essentially no symbiotic algae, so much of the light is reflected by the white coral skeleton instead of being used by the algae. The resulting increased light intensities in the new parts of the coral represent a potential danger for the algal cells that need to colonise these areas. Hence, it seems that the corals use a clever trick to help their symbionts. The higher light intensity switches on the genes that are responsible for the production of the sunscreening chromoproteins. The research contributes to a better understanding of the coral’s response to environmental stress. Knowledge of the stress resilience of corals is an important requirement to help predictions of the fate of coral reefs that are exposed to climate change and various forms of anthropogenic disturbance. The paper is published in the latest edition of the journal Coral Reefs.